Receive your first 3 issues for only £3! 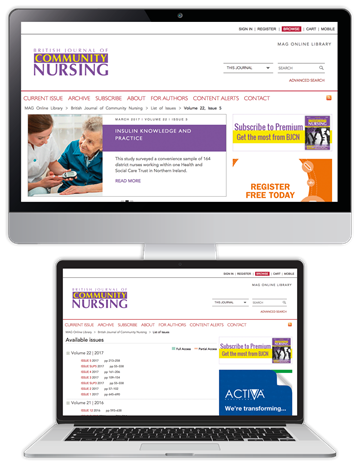 British Journal of Community Nursing is the peer-reviewed journal for district and community nurses. Published monthly, it provides up-to-date, evidence-based information and advice on all clinical and professional topics of relevance, supporting readers in daily practice. Subscribe now and get your first 3 issues for only £3 - a saving of over 92% on our normal subscription rate. 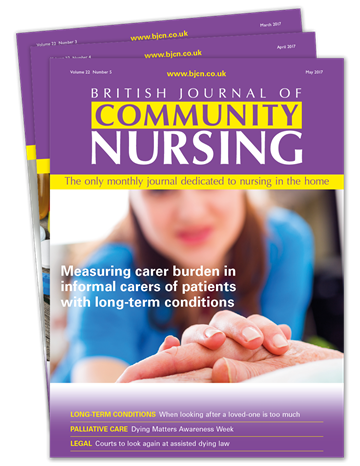 Try British Journal of Community Nursing today and discover how we can help you in practice. We are sure you won't be disappointed - but you can cancel your subscription anytime. *£3 for the first three issues of your subscription. Price will revert to standard rate of £36.00 per quarter therafter. Payment taken by Direct Debit every three months.